There’s a lot to be said about the sheer determination, compassion and total commitment to one’s craft. Guitarist Steve Kimock is someone who has put in the time as a musician and can teach us about following a simple path in life. It’s no wonder the “Guitar God” has been called the “Guitar Monk” for that reason - someone who has flown below the radar for 40 years, focusing only on his art without anything else to do, but practice and play shows. If you have ever been to a Kimock performance, you know the script with which he follows – lights come down, musicians take the stage, Kimock positions himself on his stool, he closes his eyes and waits patiently as the music begins to form and the songs begin to take shape. 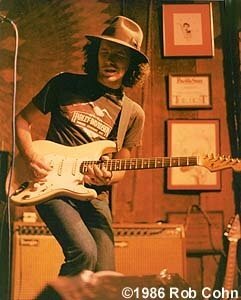 Then like a wizard Kimock works with the other members onstage weaving in and out of each other's ideas like snakes in the sand to form some of the best music out there. 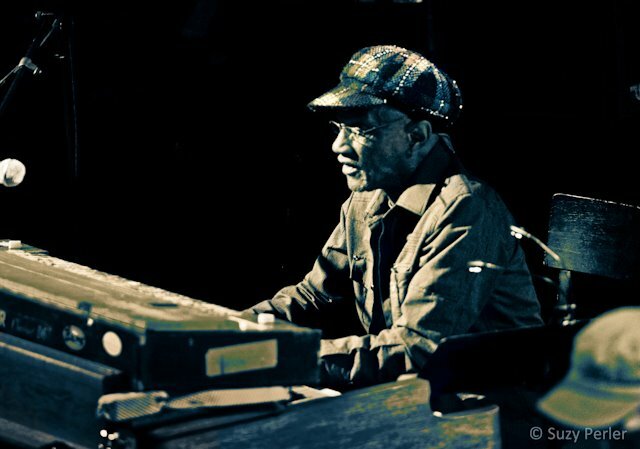 Most compositions have an introduction, then a series of complex sections with open-ended improvisational journeys, culminating with some dramatic finish. Kimock exhibits a high level of discipline onstage, but he also has a cynical and comedic personality that is evident when Kimock talks to the crowd or jokes about life. Fans are aware of Kimock’s formula onstage and are eager to go along for the ride at every moment. Shows are high energy, sometimes last for hours at a time and take listeners on a musical voyage from song to song. Look around at any Kimock show and you’ll see smiles on people’s faces, excitement in their eyes and gratitude for the music they have just witnessed. 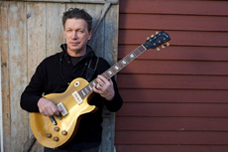 In the mid ‘70s, Kimock began his career with the folk-rock group The Goodman Brothers. In 1979, after a stint with Martin Fierro in the salsa band The Underdogs, Kimock joined The Heart of Gold Band featuring Keith and Donna Godchaux plus their drummer Greg Anton. In 1984, along with Anton and John Cipollina formerly of Quicksilver Messenger Service, Kimock co-founded the psychedelic rock ensemble Zero. In 1991, Zero recorded Chance in a Million, their most successful album to date, featuring songs by Grateful Dead lyricist, Robert Hunter. 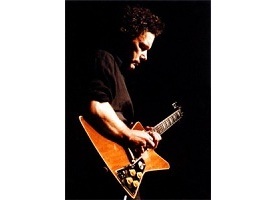 In 1998, Kimock along with Zero band mate Bobby Vega, joined with Ray White and drummer Alan Hertz to form the band KVHW, one of my favorite ensembles of Kimock’s career. But, the band only toured for two years before calling it quits, leaving precious recordings on the web and time to start a new chapter in Kimock’s life. In 2000, the Steve Kimock Band was created with a cast of musicians rotating in and out of the group every year. We never knew what we were going to get and the amount of talent at any given moment was exceptional. One SKB show in particular stands out for me as the most memorable Kimock performance of all time – namely the late-night High Sierra Music Festival set 10 years ago which began at 1:30am and didn’t stop until the sun began to come up at 5:30. Even after 4 hours the crowd was screaming for more and the band delivered a high energy show that will be remembered for a long time. From the recent posts online, the early shows of this tour are getting rave reviews and the west coast jam community will have a chance to hear Kimock as he makes his way towards California next month. With stops in Lake Tahoe, San Francisco, Santa Cruz and Hermosa Beach, the 4-piece group will show us their creativity and talent as they crisscross the country and wow audiences at every stop. Kimock will also be touring with the Everyone Orchestra featuring Matt Butler, Jennifer Hartswick (TAB), Al Schnier (moe.) Marco Benevento and other amazing musicians. If that wasn't enough, Kimock is also reuniting with Zero this August at The Lazy Summer Days Festival in Pinecrest, California. There's no doubt that Kimock has come full-circle this year playing with Billy Goodman and opening for Hot Tuna, the very first band they opened for in the early ‘70s. This summer they get to do it again, but this time the guys are older, wiser and more talented than before. Kimock and I spoke on the phone recently from his farm house and barn in rural Pennsylvania before his enormous upcoming tour. I’ve been told Kimock has musicians, family and friends coming in and out of his home and it must be a pleasure for the talented guitarist to arrive at this point of his career. First off, congratulations on your upcoming tour and busy year. It must feel great with the 50 plus shows booked, the positive energy in the band and the forward momentum you seem to have right now. Yes, it is nice actually. It comes at a good time for me musically. Because I have a bunch of stuff that I have been working on just at home where I have had my nose to the grindstone forever with what seems to be no progress. You know what I mean, when you get your face right in it that close you can’t tell what you are doing. It occurred to me after many years that I have made some progress and I do have some genuinely new stuff to play. As a player, you get to a point where you ask yourself, “Have I done this before, no I don’t think so, this is going to be fun”. Take me back 25 years when you were obviously much younger and in a much different mindset. What was the long-term goal or plan during the days of the band Zero? but practicing and living. Even with The Goodman Brothers or when I was 16 with a guitar on my back, there was only one plan, to play. “The Goodman Brothers Band” sounds like it was a lot of fun. For me musically, it was the most influential of groups in my day. I am still struggling to do every day what Billy & Frank did all the time, relentless practicing because Billy plays a great bottle-neck slide guitar and Frank is a great country-blues finger-picker. So, stuff like that takes so much to accomplish. Having both of those elements was such a treat in that group. Actually, I work and play with Billy from time to time. He is living over in Germany now, so I will fly there and play with him. We have a bunch of shows coming up opening for Hot Tuna and the deal is I’ll play with them as well. The interesting thing is that one of the first shows we did in California as The Goodman’s was opening up for Hot Tuna in 1974. That first show stands out as the first gig we did in California which was a big deal because we were the opening band at the old Waldorf. I don’t remember what vehicle we had, maybe some van. All of us were so excited being from Pennsylvania, a bunch of country boys crossing the Golden Gate Bridge, taking the city and saying, “Here We Come”. The van died on the bridge, so there we were, all short guys no more than 4 feet tall pushing the van to the edge of the bridge. 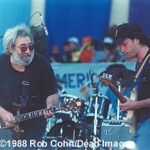 In 1988 you stood onstage with Jerry and there’s a bunch of photos on your website of you both. That has to stand out as an instrumental moment in life. Yes, that was certainly a moment and kind of unexpected during a very busy day filled with a lot of bands and tons of musicians. Zero, who I was playing with that day was sort of like the backing band for a bunch of artists who were celebrating the end of The Soviet American Walk For Peace, where a bunch of artists were walking across the United States. The culmination was in San Francisco with a big concert and thousands of people all doing interesting music. The whole thing was a big deal. Of course my dear friend Rob Cohn got some great pictures of it. Those moments endure because of his efforts capturing everything that happened that day with me and Jerry. Your upcoming tour has Wally Ingram in the lineup, a drummer who is very different than previous guys you have had like Rodney or Alan. Wally is not really a chops drummer who drives hard. But, needless to say he has an amazing feel, he’s a great person and a solid drummer overall. I just was quite surprised at your decision to go with him. It’s really more about the personality involved these days than it is the specific musical direction of the players. That’s what makes the music most interesting ultimately. Sometimes, you end up having guys who like to do their own thing in a given collective even though each style is different from one another. This particular ensemble is the most notable for being good humored, that’s what it is more than anything else. What an amazing, wonderful and goofy bunch of guys we have. The whole thing now puts a smile on my face. All in all, there’s no end to fabulous players and at some point you say, “What will allow the band to dance and be happy”. I don’t expect or believe that in a course of an event as complex as performance music for a live audience that any one person’s skill level will elevate it or not. I must say, the chemistry between you and Bernie even offstage is really great. You are so in tune with each other, comfortable being together and loving what the other does. It seems like you go way back or have known each other for years. Actually, Bernie and I have only known each other for about 8 years. He came into my scene through my son John Morgan. He wound up jamming with a funk band that Johnny was playing in doing P-Funk and Parliamant material. Bernie showed up and my son was raving about his involvement. They quickly became great friends because Bernie is so sweet and John is really mature. They got along well and he started bringing Bernie around. His introduction to my world was through family, there weren’t any professional, awkward feelings when we first started playing. Not to mention, he lives close by. He’ll come over to the studio, we’ll write and spend all day on one chord change. That’s a lot of fun for us. It’s cool to be so comfortable with someone that we are able to get inside the music. We’ll work all day and then say, “I think it’s time to make some coffee”. Then go back to it and work some more. The song “Hillbillies” has always been a favorite of mine, how did that one originate? The first section is a straight up Bobby Vega lick. I have this general sense musically for the polarity of a situation harmonically. And, the way we were treating the A-Section seemed to have this polarity to the second one – sort of a contrast and the arrangement beyond that was a very much a KVHW ensemble tendency of that time. That’s how we treated the material – different sections with an elaboration and then we’d just beat the death out of it for a couple minutes to get the dynamic up as high as you could. Once you have blown it up, you just abandon it there. The seed of Hillbillies really came from Bobbie Vega. To be at this point of your life is a great accomplishment, especially in a tough, tough business. It is, and it’s not easy or likely to get a whole lot easier. Like I said before, there aren’t any goals or plans – it’s just putting one foot ahead of another. Maybe if I had been a little smarter I could have arrived at this place sooner. I have got this far just with my nose to the grindstone, so there’s not a lot of vision involved. My view is extremely limited, I am staring at the end of my arms, there’s the finger board, I got my ears open and it’s all I can do. Thanks for your time Steve, I appreciate the wisdom and honesty. Congrats again, have a great year.